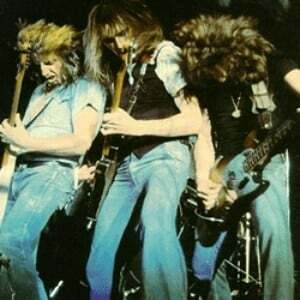 Status Quo are a British rock band (London, England) with strong boogie line. The group was founded by bassist Alan Lancaster and guitarist Francis Rossi in 1962. They began as a rock and roll freakbeat band called The Spectres. By 1967, with very little commercial success, they discovered psychedelia and changed their name to Traffic (later Traffic Jam, to avoid confusion with Steve Winwood's Traffic.) At this time the line-up also included organist Roy Lynes and drummer John Coghlan.